The titles of these shows hint coyly at the existential nature of abstraction, but it is easy to forget. Much of the earliest art from the caves through the Eyptians to the Renaissance has a religious purpose. Beyond religious art is figurative art – the Modernism pioneered by the Impressionists and Expressionists; humanist representation of contemporary people as masters of their own destiny. Beyond figuration is abstraction – where the essence of being is represented without its physical appearance. For a hundred years abstract painting has been the refuge of artists who had the urge to make divine images, but in the language of contemporary art and without the constraining iconography of a specific religion. The whole idea of abstraction is one of reduction – as the figure is taken out there is no reason not to take out other things. The outward appearance of this art logically tends toward the symbolic as the reduction of extraneous matter strips each form. As the essence become clear the transcendent religious qualities of the abstract image become apparent. They are the symbols of a new religion. Not the cross or the crescent, or the human image but a religion of nothing, or rather one that worships the reductivist journey towards nothing. Carl Andre’s floor piece in particular invites veneration. A religion that venerated the square. The fact of it being a floor based sculpture – and one that you very obviously cannot walk across – separates its space as sacred. Its cuboid form suggests that it might be an empty plinth for the god of nothing. 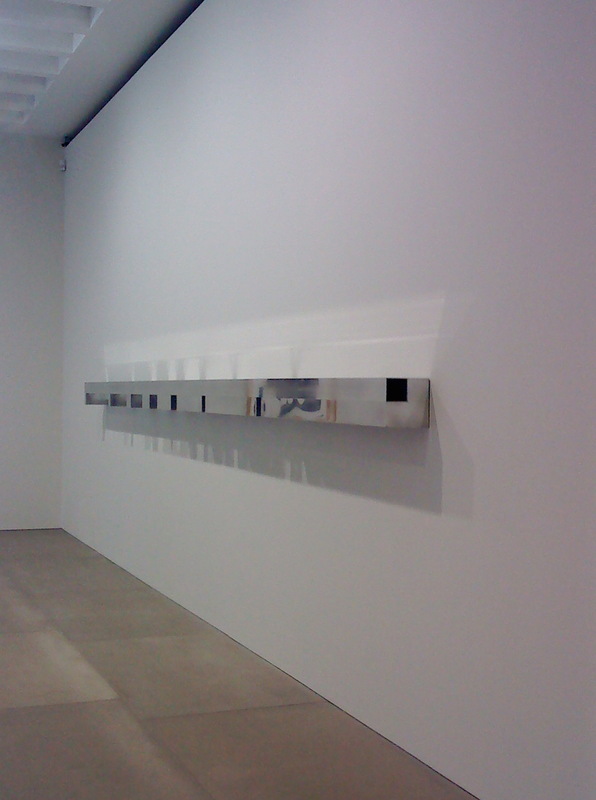 Donald Judd’s wall piece painted in quiet tones of grey suggests a delineation of space, but that is its content and silently rebukes you for thinking of things that you might fill the space with. For me this is the outstanding piece in the show – its shadows and reflections create a visual harmonic that resonates in this arid, churchy box. Fontana’s slash feels like the gate to another world, but not so much as Turrell’s piece: a projection in a darkened room. 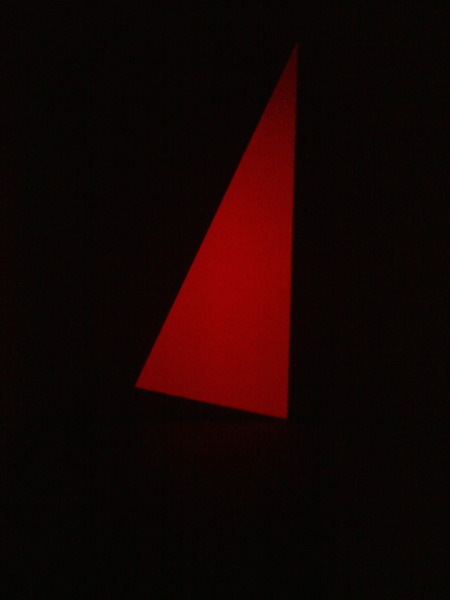 He invites into the chapel of the red triangle, where purity of light and colour lift us gently, invite us to see the form as part of the infinite. Meanwhile at the Lisson a bunch of contemporary abstract painters are revisiting the idiom. Their work seems comparatively whimsical and self conscious. Perhaps this is an echo of our historical moment. We do not have to contend with the aftermath of war or revolution, but deal instead with the death of artistic style. Sorry I didn’t get any pics of this! Monteiro’s painting deliberately irritates the viewer by disrupting the edges of each field with a drawn line impasto (if that is the right term) of the same colour simultaneously implying and denying spatial qualities. Almost as if he is using paint as a sculptural material that references painting. Cory Arcangel creates gradients, we are told, in Photoshop and then reproduces them as full scale abstract works. There is the usual Lisson detachment and irony at work here. Art, like Pop before it is eating itself. Before shitting itself. This work mocks and undermines the religious qualities that we have been schooled to admire in Rothko or Pollock. The sense of cosmic vastness, or the sense you can lose yourself in pure colour and form is dented. When not even nothing is left, there isn’t a lot of fun to be had. 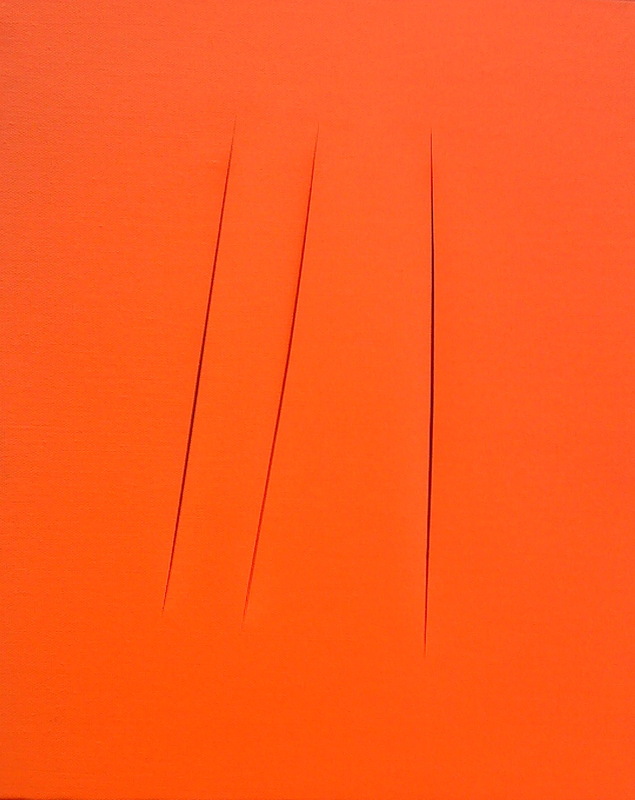 This entry was posted in Abstract, Art, Contemporary, Galleries, London, Painting, Uncategorized and tagged Abstract, abstract painting, abstraction, Art, Blain|Southern, contemporary art, figurative art, Fontana, Galleries, Judd, Lisson, Lisson Gallery, London, Modernism, Painting, Religious art, Turrell, West End. ← Suffering from a loss of power.